How far would you drive for a brand new in-box water heater for $150? About 100 miles one way, when the power is out and you have nothing else to do...that's what my hubby and I did on Sunday. We want to replace our electric with gas and found one in Brevard NC. As we weren't in any great hurry my hubby stopped along the way for me to take some pictures. I love waterfalls, big, small, makes no difference. In the warmer months some are hard to see for all the trees and bushes, but in the winter, oh goodness. Looking Glass Waterfall is so named for the rock that it flows over. In the winter months the water freezes to the rock and when the sun hits it it shines like a mirror or glass. 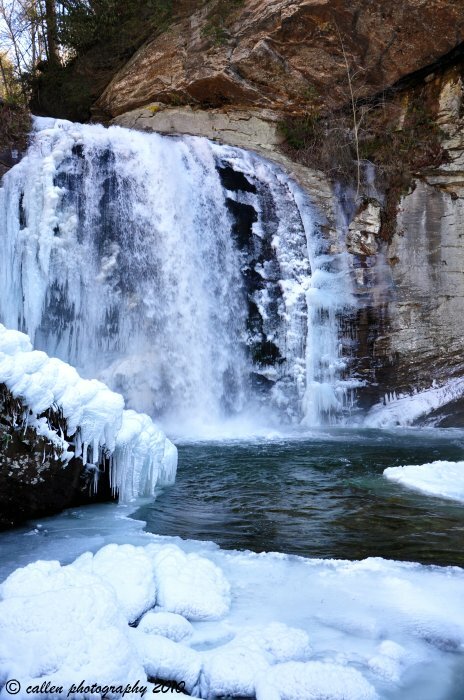 It falls 60 feet to Looking Glass Creek, also named for the rock. It was quite beautiful to see. All the overspray was frozen on anything and everything. 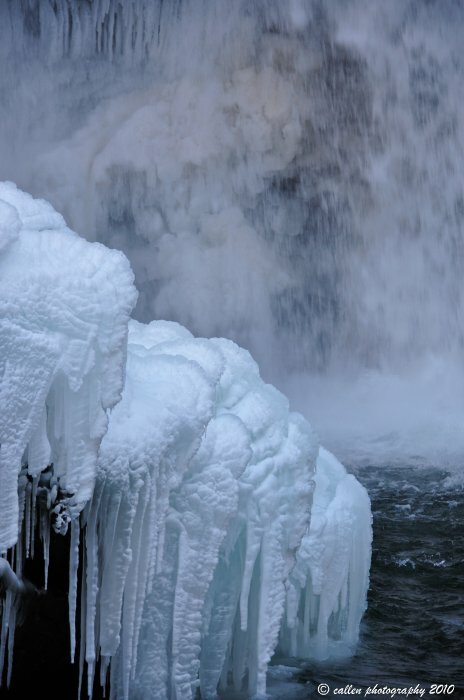 I couldn't resist several photos, but was not as brave as the two guys I saw down on the frozen part of the creek taking pics of it head on..
doesn't look so tall from this perspective, but I loved it so muchI made it my header shot. If you ever get the chance to visit it's worth it. Winter or Summer. You can swim in the creek and get under the waterfall in warmer months....might have to visit again soon with the family. These are lovely, Colleen, and they make me homesick.... 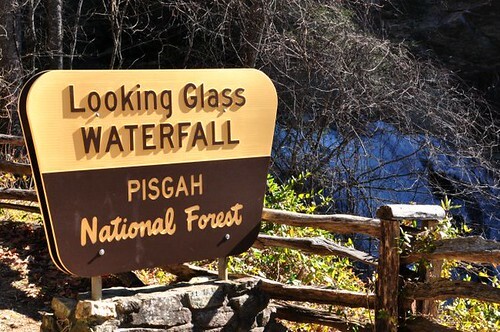 I've been in Pisgah National Forest many times, but never to this waterfall (unfortunately). The frozen spray looks so soft, but I'm guessing it is not? Thanks for sharing these. Love, love, love the new blog header!! The waterfall is just stunning! I bet you will be glad when spring arrives!! You really have been having some cold weather back your way...BURRRRRRR!!!!! 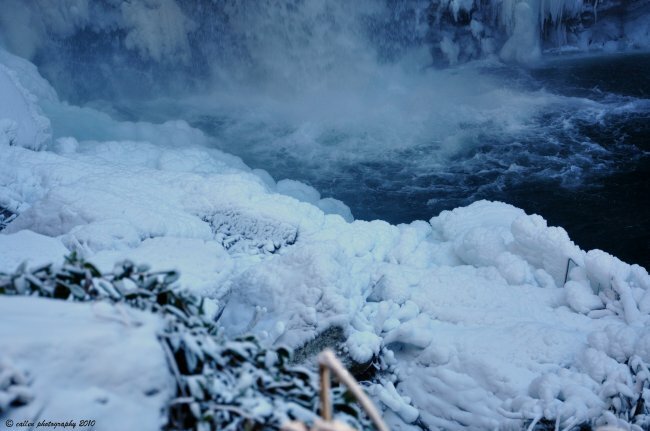 I've been to Lookinglass Falls before, but not in Winter! What a neat view of it--but I'm glad it wasn't me standing in the cold to capture that one! I love Brevard (and all the waterfalls of Translyvania). There's a large woodcut of Avery Creek hanging over the buffet in our dining room I purchased there. Glad you got a new water heater, we just drove the same distance to get ours the month before. Gorgeous! Your photos are just magical! And I love the header, too. I'd love to see this place, especially in the summer. Congrats on the great deal for the water heater. Is it all hooked up now?